People frequently ask me, "What is your favorite thing to make?" This question is tough for me because I like to make whatever inspires me- and that qualifies as just about anything! Fresh, local and seasonal ingredients stimulate my passion for food. Nose to tail cooking and eating does as well. The book The Whole Beast: Nose to Tail Eating by the legendary Fergus Henderson serves as the perfect guide to celebrating the whole animal. You are respecting the animal and not being wasteful. This is what people all over the world are and have been doing since the beginning of time! I was thinking about this reason while cleaning the raw liver for this pâté. How can most people justify eating the thigh or the breast (or whatever "normal" part of an animal) but not justify the rest of it's parts? By this I mean, if you think about all of the body parts what makes the thigh better to eat then the liver? They are all main body parts that work together. 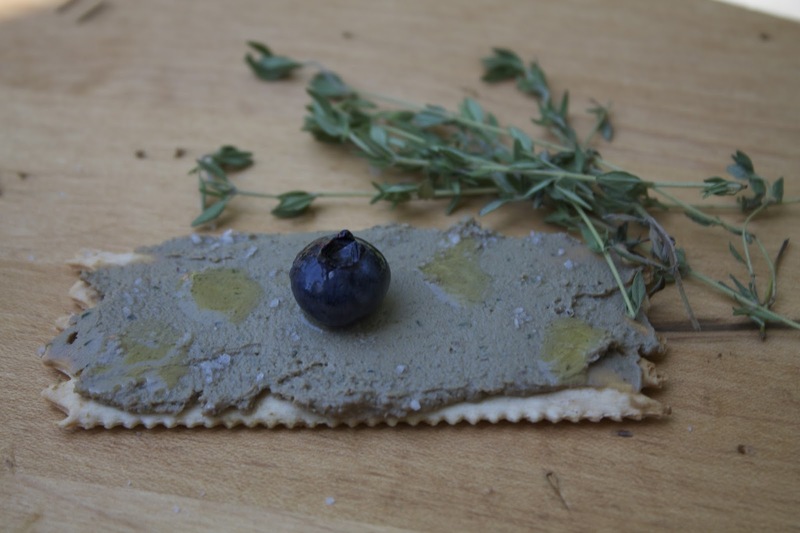 So whether you love liver but just haven't tried making it or want to try a new recipe or have never tried liver before in your life, I encourage you to give this pâté a try! Wash/rinse the chicken livers. Pat the livers dry by using a paper towel. Trim the livers of any discolored parts or extra veins. Make sure that the livers are all similar in size so cooking time is even. Put aside. Heat a sauté pan on medium heat. Add enough butter and olive oil to coat the pan. Add the shallots. Season with salt, black pepper and red pepper flakes. Cook the shallots for about 5-6 minutes. Next add your alcohol of choice (I went with port) to the shallots. Also add the thyme and parsley. Cook for about 4 minutes or until most of the alcohol has reduced and cooked off. Put this mixture into a food processor. Add a good amount of butter and/or olive oil to the same-empty pan. Place the liver in the pan (do not crowd the pan) . Season with salt and pepper. Make sure the livers sear on both sides. About 2-7 minutes depending on the thickness of your liver. You are looking for a nice golden brown on each side and light-pinkish inside. Place the liver into the food processor and puree. Then add the cream and two tablespoons of butter. Add capers if you desire. Adjust the seasonings to your liking. Serve the pâté chilled. Choice #1- Push this finished pâté mixture through a fine mesh. This will make the pâté more mousse-like and get rid of any grittiness. Or you could leave it the way it is! Choice #2-You could seal the top of the pâté with about 4-5 tbs. of clarified butter or another melted fat or you could choose not to; however, the butter will help to give this pâtè a longer fridge-life. With the butter on top this will last about a month in the fridge where as without the butter, it will last no longer then a week. Serve the pâté chilled with good quality crackers and bread and some or all of the following accompaniments. This pâté is best when made ahead so that the flavors can marry and chill. This would be great to serve along with a cheese platter.